Two men have been caught on CCTV using a child to help them rob a charity shop raising money for Cancer Research. 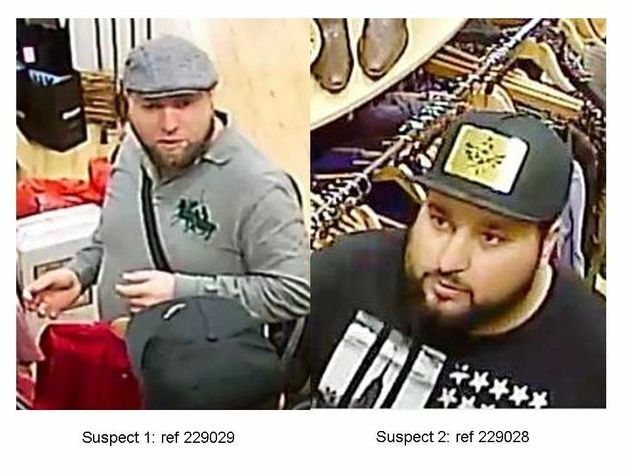 In footage released by police on Wednesday one of the men is seen distracting the sales assistant, while the other man walks over to the till with a small boy, believed to be five years old. The man gets the child to pick up a mobile phone which he then encourages him to conceal in the front of his trousers. The trio then left the store with ladies’ clothing - which they did not make any attempt to pay for - and the phone, which belonged to a charity shop worker. Police were called to the theft at the Cancer Research shop, on Wimbledon High Street in south-west London, on 11 October at 3.45pm. The first suspect is described as a large white man in his early 30s with a brown beard. He was wearing a grey long sleeve top with a green logo on his left breast, grey cap, black shoulder bag, black shorts and black and white trainers. The second man is described as a large white man in his late 20s wearing a dark blue t-shirt, dark blue peaked cap, dark red trousers, white socks and dark shoes.